Yet while politics may divide them, money, apparent access to state funds and facilities, and donations from private pockets and public coffers that could have funded their “pol ads,” seem to unite those with biggest pre-campaign adspend among the senatorial candidates in the upcoming May elections. From January 2018 to January 2019, the combined ad spending of 18 candidates on TV, radio, print, and outdoor ads have reached P2.4 billion, by the rate card of media agencies monitored by Nielsen Media. Yet, just a few have net worth values bigger than their respective adspend. Possible sources of those millions of pesos poured into pre-campaign ads include hidden wealth, public funds, and even indirect bribery from private donors. In 2010, the combined pre-campaign adspend of six candidates for president and four for vice president from Nov.1, 2009 to Feb. 8, 2010 amounted to P1.472 billion. In 2013, the leading candidates for senator incurred pre-campaign ads worth P892 million, from Jan. 1 to February 11, 2013. From Jan. 1, 2015 to Jan. 21, 2016, about 105,000 pre-campaign ads valued at P6.7 billion featured the candidates for president and vice president in the May 2016 elections. In the runup to the May 2019 polls, the 12 candidates under the Hugpong ng Pagbabago-Partido Demokratikong Pilipino (HNP-PDP-Laban) banner and endorsed by Duterte, incurred a combined adspend of P1.32 billion in the last 13 months ending January 2019. A third of this total or P422,498,647 consists of ads purchased by and for Christopher Lawrence “Bong” Go, the biggest spender thus far among all 61 candidates for senator. The mystery is stark: Go – formerly special assistant to the President — is the poorest of the top adspenders with a declared net worth of only P12.85 million, and cash on hand/in bank of only P3.9 million, as of his December 2017 Saln. His P422-million total ad buys amount to 3,287 percent of his net worth. Put another way, he bought political ads 32.9 times in value compared to his total personal wealth. Minus all that he owns, P409.6 million was the unfunded balance of his ad buys that Go might have paid using money from either public or private sources. In January 2019, Nielsen Media’s monitoring of TV ads only listed Go as the product, brand, and advertiser in at least 1,016 ad spots equivalent to 29,940 seconds of airtime exposure at a cost of P247.9 million. Nearly one in every three ads (total of 3,261 ad spots) that aired on TV channels last month featured Go. For January 2019 then, Go spent an average of P7.99 million every day on TV ads, or two-thirds of his latest declared net worth. Another Hugpong candidate, Ma. Imelda “Imee” Marcos, the second biggest adspender, repeats Go’s strange story. Marcos, currently the third-term governor of Ilocos Norte, has acquired P413,160,423 worth of ads from January 2018 to January 2019, but has declared a net worth of only P24.49 million and cash on hand of only P2.45 million in her December 2017 Saln. Her adspend comes up to 1,687 percent of her net worth; her adspend deficit, minus all her declared wealth, amounts to P388,666,931. The fourth placer among the big ad buyers is Harry Roque, a Hugpong-endorsed candidate who quit the Senate race this Feb. 1, reportedly for health reasons. As of Jan. 31, however, Roque’s adspend had reached P174,013,944, or P75.1 million more than his declared net worth of P98.87 million, as of December 2017. The former presidential spokesman’s adspend amounts to 176 percent of his net worth, and even his P54.6 million cash on hand and in bank that he reported in his latest Saln. The other Hugpong candidates who have also incurred pre-campaign ads are re-electionist senators Cynthia Villar, Joseph Victor Estrada Ejercito, Juan Edgardo Angara, and Aquilino Martin Pimentel III; former senators Jose Estrada, Ramon Revilla Jr., and Pia Cayetano; Maguindanao 2nd District Rep. Zajid Mangudadatu, former Duterte adviser Francis Tolentino, and former TV journalist Jiggy Manicad. 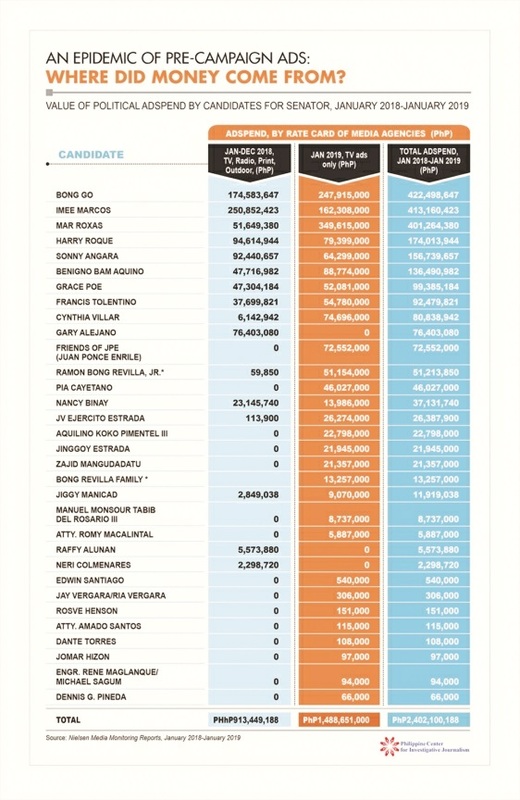 Yet while all of them are among the top 20 pre-campaign adspenders, these candidates’ combined adspend in the last 13 months comes to only a third of the administration slate’s total of more than P1.5 billion, or over P518 million. The bigger two-thirds balance represents the pre-campaign adspend of Go, Marcos, and Roque.